OCOEE, Fla. - A Central Florida Homeowners Association is planning to cut down as many as 455 trees lining neighborhood streets because the roots are breaking apart the sidewalk, creating potential lawsuits. 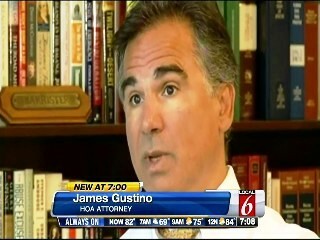 But some homeowners believe the move is too drastic. "The reason we moved into Westyn Bay was because of the trees," said Myra Couzo, who has lived in the gated subdivision since it was built nearly a decade ago. "I think they're important for shade, they're important for the birds, they're important to our earth." some trees have grown under the sidewalk, causing the pavement to buckle. At least one person has been injured on a raised sidewalk in the neighborhood, according to HOA Attorney James Gustino. "People trip and fall, they sue the association," he said. Since Westyn Bay is a gated community, the HOA - not the city - is responsible for maintaining sidewalks and roads within the community. The HOA board recently spent more than $5,000 smoothing out bumps in the sidewalks and replacing entire sections of pavement, according to an email sent to homeowner's by HOA president Greg Keethler. "We can't cut down all the trees just so that we won't get sued. It doesn't make sense at all," said Couzo. Several homeowners stood outside the gates of Westyn Bay Thursday night passing out flyers to their neighbors and encouraging them to tie yellow ribbons around trees they wish to save. "I'm a realtor for 23 years," said homeowner Lucy Martinelli, who is concerned that removing trees will hurt her property value. "I would not buy a house in a neighborhood whose standard is, 'Okay, your tree is pretty but it's got to go because it might do something in 10 years.'" 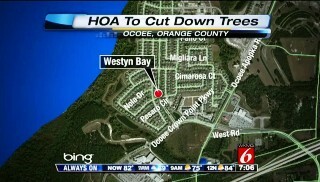 The HOA's attorney believes the potentially large trees should have never been planted in such a small plot of land. "This is going to be a problem that is going to penetrate virtually every community that's been developed within the past 15 years in Central Florida," said Gustino. The Westyn Bay Homeowners Association is holding an informational meeting Monday night about the issue. Although the HOA board has already approved the tree removal plan, some homeowners hope the HOA board will reverse its decision.